Step into Downtown's most original night time walking tour with dazzling neon, some old school Vegas stories, topped off with cocktails at two really cool legendary bars. Our small group twilight tour is a 2 hour trek through 6 historic blocks to see the last great Las Vegas neon signs still ablaze. We'll walk down Fremont, our Neon Broadway, a carnival like street that's become a stage, where we may see an Elvis, a Vegas Showgirl, or a new bride doing a jig. Your expert local guide will share tales of famed casinos and some true grit Las Vegas characters, offering up little known insights on the curiosities and the lore of Downtown. Our stop at the famed corner of Glitter Gulch is a spectacular and unique neon moment followed by a nightly light show towering overhead on a 4 block long video screen. Finally, it's on to a famous bar with a not so secret mobster connection, for a cocktail and a parting toast to the fabulous signs that made this place famous. Viva Las Vegas. Fabulous neon, historic bars, quirky characters, and the lore of Las Vegas are the quintessential ingredients of a spirited 2 hour walking tour of Fremont Street topped off with cocktails and hearty toasts at two of Downtown's most famous bars. Our small group tour starts at dusk, where we'll meet up at an historic hotel for a complimentary welcome cocktail. 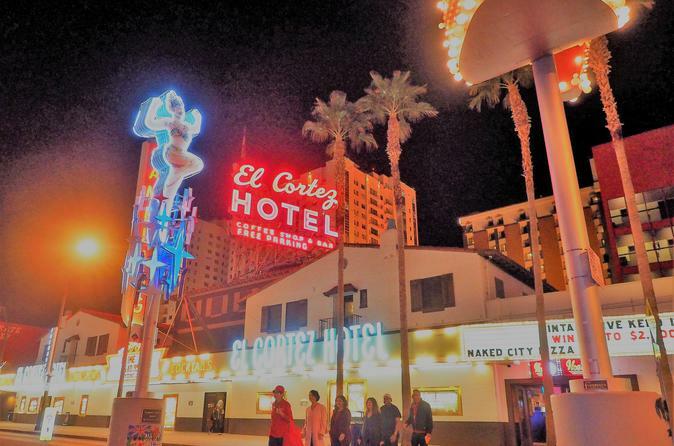 Then, it's on to Fremont Street to view the famed signs of the El Cortez Hotel, Downtown's historic crown jewel, now a building on the National Register. We'll pass by a popular new neighborhood trending as an arts, retail, and festival district that has a famed fire sculpture from the Burning Man festival. We'll trek over to the 4 blocks of the Historic Casino District, crossing the famous Neon Trail that connects the Neon Museum to the legendary "Welcome to Las Vegas" Sign. Nearby Slotzilla Plaza features a spot that marks the city's love of "the success of excess". Here your local tour guide will share some little known gems of local lore that links past to present. Then we’ll head over to Glitter Gulch, the historic four blocks of the original Casino District that began in the 1930s with legalized gambling – and is still home to ten storied casinos and iconic signs. Today, the street is both a public square and a vast outdoor mall dominated by a gigantic video screen, 90 feet above the street, with productions nightly that may feature songs by the likes of Green Day, Imagine Dragons or Bon Jovi. It's all part of a nightly street carnival extraordinaire, with parades of participants, from Elvis impersonators to scantily clad Vegas showgirls reminding us, after all, that we're in Sin City. Standing at the towering old cowboy sign, Vegas Vic, you'll get some amazing details of old Vegas, and you'll stand in a place for an "only in Vegas moment" where the neon sign is the building and the building itself is the sign. Along the way, the guide will share some little known facts, oddities, local folklore, pointing out some sites of memorable movie scenes. But the main attraction is the neon – miles and miles of it, all making up the legendary electric architecture that made Las Vegas famous, ending the night with a cocktail at a classy bar of movie lore with a toast to all things Vegas.